ANIMAL NATION DOESN'T KNOW ANYTHING. : Albums of Influence - Broken Social Scene's "You Forgot it in People"
Albums of Influence - Broken Social Scene's "You Forgot it in People"
I love that this album has so much more to offer when listened to with headphones. I love the slight panning adjustments halfway through lyrics. I love the hidden background voices that 99% of people that listen to it will never hear. It feels like I have a secret with this album, and only people that REALLY want to know it get to find it out. It's like the kid that built walls not to keep everybody out, but to see who was really interested in knocking them down. It's hard to say if this is the best Broken Social Scene album.. mostly because preference is kind of objective, and it's not really up to me to state whether one album is better than another... it's also hard to determine if this is my favourite BSS album. I might like Kevin Drew's 'solo' album, Spirit If..., more, but this was the first BSS record I got into, probably making it the most influential. 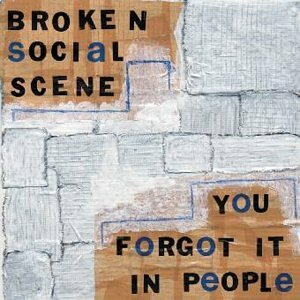 Make sure to download the entire Broken Social Scene - You Forgot it in People album for free - here. Then wait patiently for the new album to come out in May of this year. Other awesome BSS albums include their self titled "Broke Social Scene" album, Kevin Drew's "Sprit If...", as well as all sorts of other contributing members' albums - Metric, Feist, Stars, Amy Millan... all amazing.